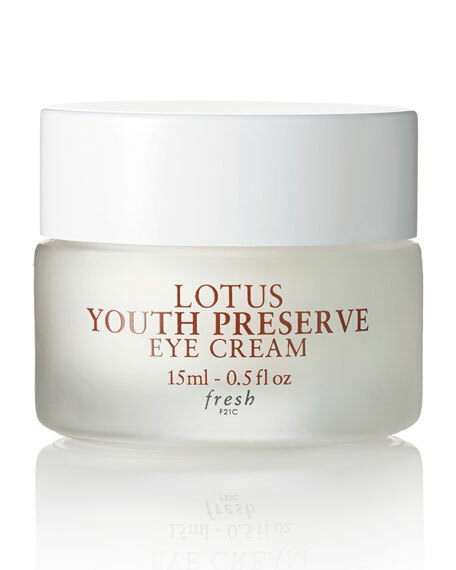 FreshLotus Youth Preserve Eye Cream, 0.51 oz. Fresh Lotus Youth Preserve Eye cream illuminates while delivering 24-hour moisture for a radiant, youthful glow around the eye area. The lightweight formula revitalizes the eye contour while combating dullness for a luminous, rested appearance. It includes Fresh's Super 7 Complex, specifically designed to minimize and prevent early visible signs of aging, enhance radiance, and provide antioxidant protection, and is further boosted with protective star fruit extract.